Nicolay, the Dutch producer best known for his excellent Foreign Exchange collaboration (2004’s Connected) with Phonte Coleman from Little Brother, will release a new album with Houston rapper Kevin “Kay” Jackson (a familiar presence on the Rappersiknow.com site) next year. Set for release on February 12, Nicolay & Kay’s Time:Line is the first full-length album from Nicolay Music Recordings, an imprint the producer formed earlier this year. Groove Attack will distribute the disc. It features guest shots from Oh No, members of the Strange Fruit Project and Chip Fu from the Fu-Schnickens (! ), among other talented prospects found in Nicolay’s adopted home of Wilmington, North Carolina. Time:Line is reportedly a concept album, but I’m not sure what the concept is — other than, when it comes to the deeply soulful Nicolay, it will probably involve romantic love. 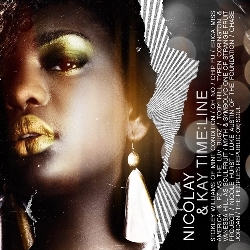 Time:Line is the first of several projects Nicolay plans for the near future. Others include sequels to his popular mixtape The Dutch Masters and the instrumental City Lights, and a mixtape with DJ Rhettmatic. No word yet, however, on when fans will hear the new Foreign Exchange project, Leave It All Behind, other than to expect it next year. Before we get ahead ourselves, though, let’s enjoy the new Time:Line album. The track listing is below. This entry was posted in News and tagged Kay, Nicolay. Bookmark the permalink.